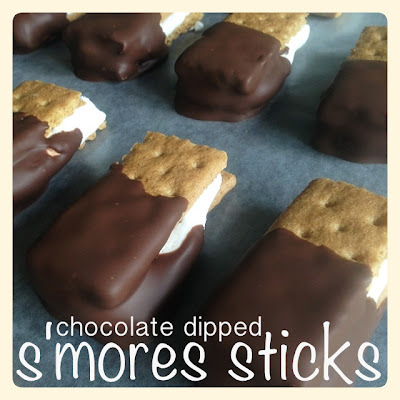 These are made right in the microwave, so no need for a campfire! 1) Break each graham cracker rectangle in half, then break each half in half (you should have four small 'sticks' of graham cracker). Honestly, I think breaking the graham crackers apart without unevenly cracking or chipping them was the most difficult part! 2) On one microwavable plate, place four sticks of graham crackers and one rectangle of chocolate bar on each piece (see photo below). 3) On a second microwavable plate, place four sticks of graham crackers. Then take one of your marshmallows and use kitchen scissors or a knife to cut it down into a relatively thin rectangle. I cut the large "s'moremallows" lengthwise into four pieces. If you are using regular marshmallows, you can probably cut them in half length wise. You don't want your marshmallow to hang over the sides of your graham crackers or to be too thick or it will be a mess when you microwave and try to dip the cracker! 4) Place your chocolate graham cracker plate into the microwave for about 35 seconds until the chocolate is soft, but not completely melted. Take it out of the microwave then put your marshmallow cracker plate into the microwave for about 15 seconds, just long enough for them to puff up. 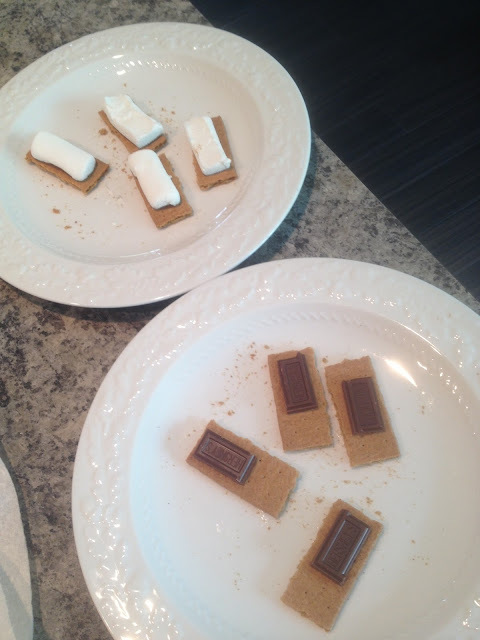 Remove the plate and carefully place a chocolate/graham cracker onto the top of each marshmallow/graham cracker combo. 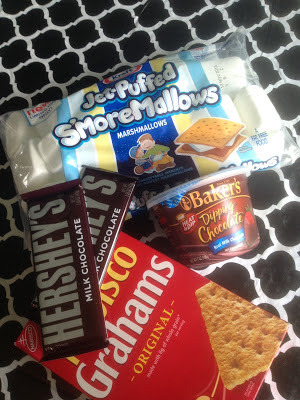 Don't smush them too hard...you don't want the marshmallow to ooze beyond the borders of the cracker if you can help it! 5) Place your graham cracker sandwiches on a plate or baking sheet and pop them into the freezer for at least 5 minutes. While they are hardening, melt your dipping chocolate. I used Baker's Dipping Chocolate that is already in a container and can be found in the baking aisle at the grocery store. Follow directions on the package to melt. 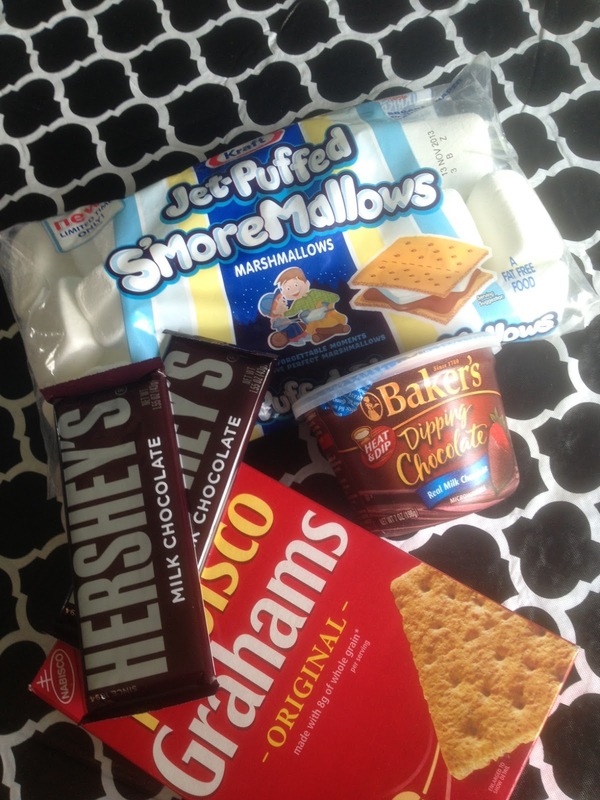 6) Take the graham cracker sandwiches out of the freezer and dip/cover each one about half way. Place onto a plate or baking sheet covered in wax paper and then place in the fridge or freezer to harden the chocolate before serving! Enjoy!! These look great. Seems like these would be easy to include in a gift treat plate. Thanks for sharing.